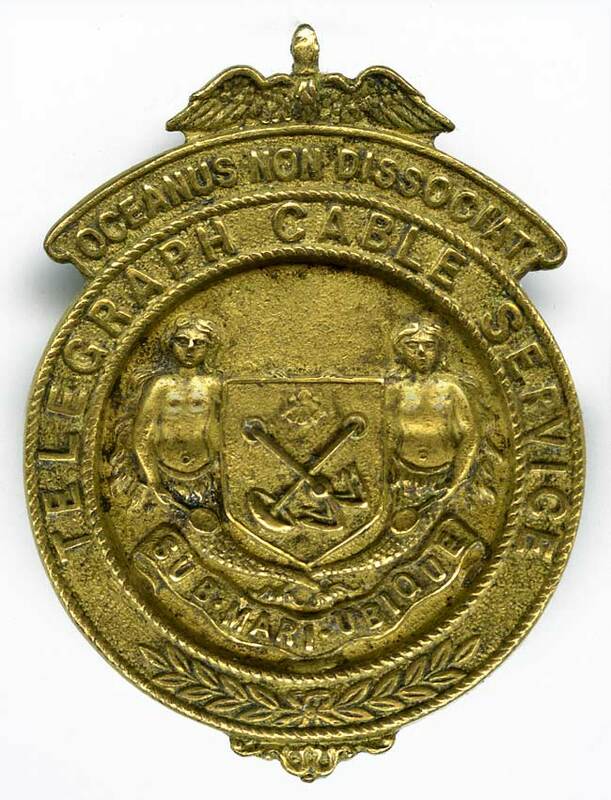 This brass badge is titled Telegraph Cable Service and bears the mottos Oceanus non Dissociat [the ocean does not separate] and Sub Mari Ubique [everywhere under the sea]. A shield with crossed grapnel and mushroom anchor is guarded by two mermaids; the design is surmounted by an eagle and has laurel branches underneath. The badge measures about 1¼" across its diameter and has a tab on the back so that it can be worn in a buttonhole. The tab has the number “3394” stamped on it. Other examples of this badge have different numbers, so this was presumably to identify the badge’s owner. The maker is identified on the back of the badge as Firmin & Sons, St. Martin’s Lane, and the company is still in business today. The Porthcurno Telegraph Museum in Cornwall, which holds the archive of Cable & Wireless and its predecessor companies, has documents which identify it as a World War I Service Badge issued by the Eastern Telegraph Company to its employees who remained on cable duty during wartime. When the First World War began in 1914, Britain had only a small army, but tens of thousands of volunteers from all classes of society soon enlisted, some with a romantic view of war, others because of social pressure. This was reinforced by the Order of the White Feather, an organisation which aimed to coerce men to enlist in the British Army by persuading women to present them with a white feather if they were not wearing a uniform. This campaign was so effective that even public servants and essential war workers, which included employees of the telegraph and cable services, were pressured to enlist. The Home Secretary, Reginald McKenna, therefore issued employees in state industries with lapel badges reading “King and Country” to show that they were serving the war effort even though not in uniform. Other official badges read “On War Service”. Cablemen were no strangers to conflict. They served at the company’s offices and stations all over the world, many in remote or hostile locations, and had a strong sense of camaraderie. During wartime they continued work on cable laying and repair expeditions even under enemy fire, and maintained communications until the enemy broke down the doors. A famous example of this is the November 1914 attack by the German ship SMS Emden on the the cable station on Direction Island, one of the Cocos (Keeling) Islands. But even though the majority of cable employees stayed on so that the crucial lines of communication throughout the Empire could remain in service, so strong was the urge to serve “officially” that some of the Eastern Telegraph Company’s employees resigned their positions and joined the armed forces. It was reported that in reply to our further application the army council now state that they have no objection to the use of private badges provided that the design does not include any part of the Royal Insignia or the words “On His Majesty’s Service.” The following words to be embossed in the badge “Telegraph Cable Service”. “On the roll of honour” is an expression usually ascribed to those men who have done brave deeds, received wounds, or lost their lives whilst fighting for their country. It might also be applied to those who stay at home and do the work required of them...It is infinitely more difficult to many of us to go through the daily routine of ordinary life to the best of one’s ability than to fight for one’s country! A great regret in the lives of each one of us is, and always will be, that we were, by the unique nature of our duty, prevented from taking a more active though possibly not less important part in the service of our country during the war...There was very little glory or recognition. 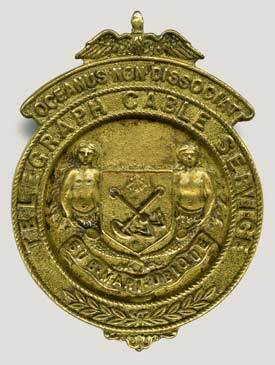 The Telegraph Cable Service badge, while an important recognition of the essential nature of the cable industry in wartime, could not prevail over what was at the time seen as the great honour of military service. Gagen, Wendy: “Not Another Hero: The Eastern Telegraph Company’s Creation of the Soldier Hero and Company Man”. By kind permission of the author, the full text of Wendy Gagen’s paper, with illustrations, is now on the Atlantic Cable site. 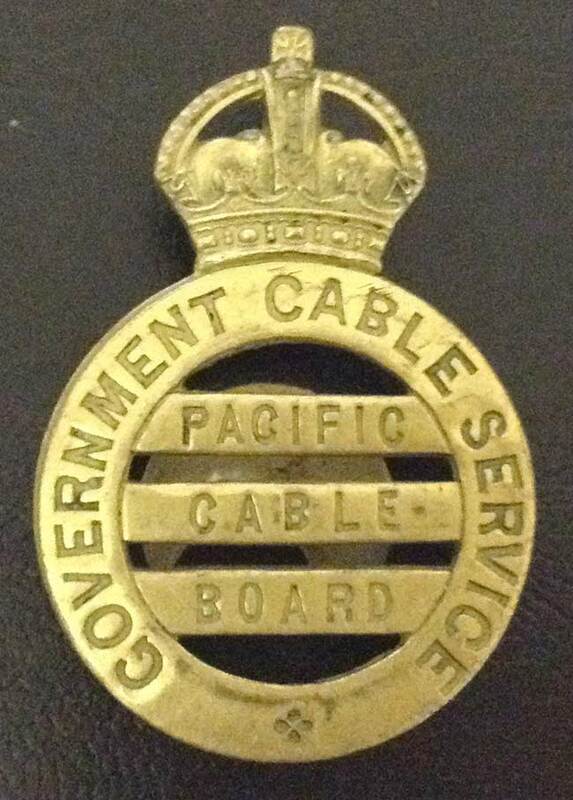 A site visitor has sent a photograph of a similar badge with the wording Government Cable Service - Pacific Cable Board. After years of discussion between the various governments, the Pacific Cable Board was established in 1900 to manage cable communications for countries of the British Empire around the Pacific Ocean. It had members representing Britain, Canada, Australia, and New Zealand, and was responsible for Pacific cables until the late 1920s. In 1929 the Pacific Cable Board became part of Imperial & International Communications Ltd., which in 1934 became Cable & Wireless. As the Pacific Cable Board was a government entity it is possible that the company issued its own staff badges during the First World War for the same reason as the Eastern Telegraph Company. I have not been able to find any records to confirm this, so if any site visitor has further information on this badge I would appreciate your emailing me.